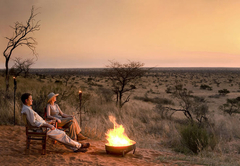 Tswalu Kalahari Reserve is a highly recommended Northern Cape game lodge providing a wildlife experience for discerning tourists visiting Kalahari. 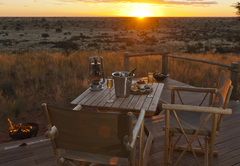 Situated in the heart of the malaria-free Northern Cape Province, Tswalu Kalahari Reserve is the ultimate safari experience. 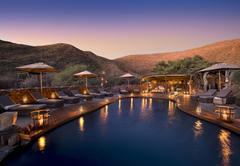 The surroundings are elegantly simple with a luxury swimming pool opening to the remarkable scene of animals drinking at a nearby watering hole. 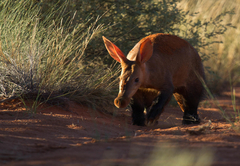 A trip to Tswalu Kalahari Reserve is unique in many ways, offering a more exclusive, more tailor-made experience - not to mention more species of animals and birds than any other African game reserve. 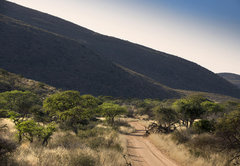 Explore Tswalu with your personal ranger and tracker by Land Rover, horseback or foot. 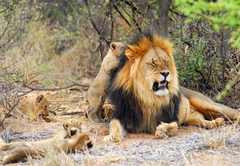 You’re sharing the environment with Springbok, Buffalo, Lion and Kudu. 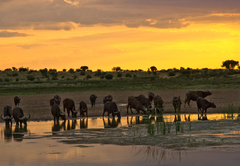 Watch the wildebeest herd surge forward with long tails streaming behind them. 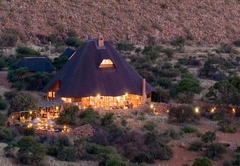 The large main lodge centres the Tswalu site. 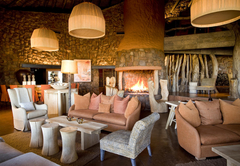 Keeping within the African style of thatched roofs and traditional décor the lodge boasts a galleried library, dining room and bar with it's centre piece a vast open fireplace soaring up high into it's roof. Closed off from the safari grounds by huge wooden gates the site retains its outback feel without compromising its luxury facilities. 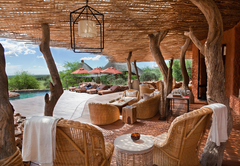 The surroundings are elegantly simple with a luxury swimming pool opening to the remarkable scene of animals drinking at a nearby watering hole. 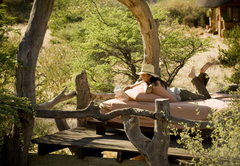 Every effort has been made to give a true African Safari experience at Tswalu. 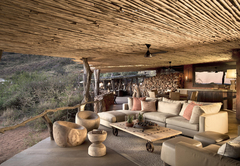 Designed to blend inconspicuously into the surrounding mountain range, Motse (Motse: Tswana for house/lodge) is surrounded by nine spacious legaes (Legae: Tswana for small house/suite), and designed in classic African style whilst offering unrivalled elegance. 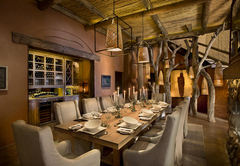 At Motse, guests can relax in the lounge or enjoy meals in the dining room. A patio overlooks the outdoor heated swimming pool and pool terrace. 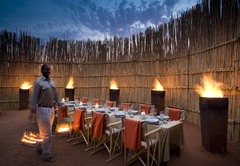 Guests can dine under the stars in the traditional African boma. 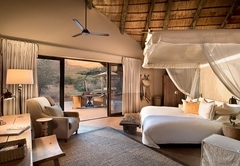 In addition, Tswalu has a walk in wine cellar stocked with the Oppenheimer Collection and South African wines, a mezzanine library with TV/satellite, Dimpho (a gift shop) and Jwa Bana (children's room). 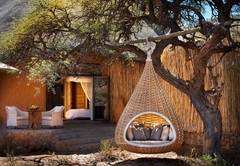 Each of the nine air conditioned legaes are built of local stone, rich red clay and typical Kalahari thatch. Accommodation is for twenty two guests sharing in seven double legaes and two two-bedroom family legaes. Comprising spacious bedroom, en-suite bathroom, both inside and outside walk in showers with views across the plains, large lounge with open fire place, direct dial telephone, safe, mini bar and larder. 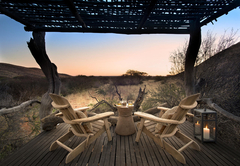 A private sundeck overlooks a waterhole. 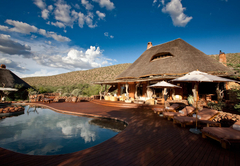 Tarkuni is set powerfully amid two rolling mountain ranges in its own private area of Tswalu Kalahari Reserve. 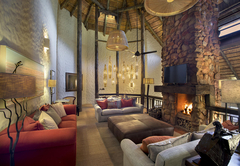 It is available to families and small groups of up to 8 guests for the ultimate African experience in total privacy. Specific accommodation for children is available. Guests can find calm at the contemplation "sala", sun themselves at the pool or retire to lofty bedrooms with vistas that beguile the most jaded traveller. 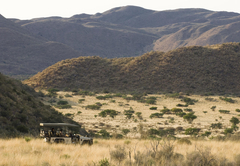 Private game viewing vehicles are included as well as a dedicated chef to allow the luxury of flexibility. 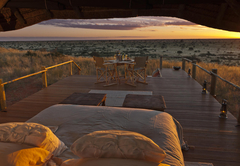 Tarkuni is remote and sensational enjoying all that Tswalu Kalahari Reserve has to offer. 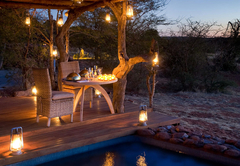 Dine in opulent style around a crackling fire in Tswalu's Motse, or under the stars in the lantern-lit boma, or by lamp light around the pool. 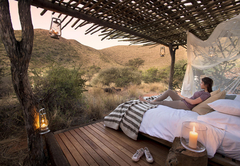 Whatever the settling - whether at the Motse, the Koranna Lookout or on safari - the food, like the surroundings, is superb. 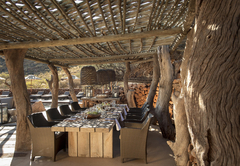 Tswalu's five star cuisine is Pan-African in style and prepared in traditional fashion by highly acclaimed chefs and complemented by the finest wines from Tswalu's cellar. 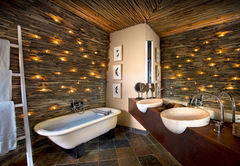 The Relais & Chateaux Gold Shield is an endorsement of the standard of excellence that is Tswalu's trademark. 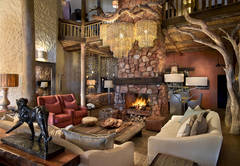 At Tswalu, guests can relax in the lounge or enjoy meals in the dining room. A patio overlooks the outdoor heated swimming pool and pool terrace. 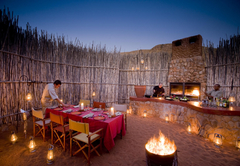 Guests can dine under the stars in the traditional African boma. 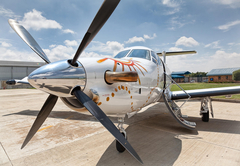 In addition, Tswalu has a walk in wine cellar stocked with the Oppenheimer Collection and South African wines, a mezzanine library with TV/satellite, Dimpho (a gift shop) and Jwa Bana (children's rooms). Elemis spa-therapies, body treatments & massages. Elemis has over 15 years experience in treating both men & women in the professional spa environment. Each spa-therapy has been developed using extensive clinical and scientific studies to ensure every therapy shows real results. Designed to respect the body's complex physiology, Elemis spa-therapies work in natural synergy with the skin, body & mind. 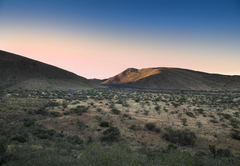 The incredible beauty of the surroundings and the great variety of wildlife make the safari at Tswalu an unforgettable experience. Here is the opportunity to observe many endangered animals in their natural habitat and see a variety of birds, insects and desert vegetation. 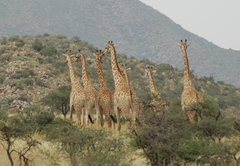 Tswalu is justly proud of the success of its ongoing conservation projects, with the founder population of 7,000 animals having grown to more than 12000 in the space of 5 years. Motse Suite: 2 children under 12 are free when sharing with 2 parents. For children over 12 a Family Suite must be booked or an additional Suite is required. Please indicate your flight choice in the notes on the booking form if applicable. 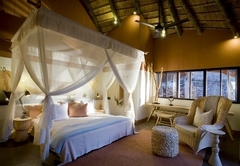 Motse Family suites with 2 separate bedrooms, each with an en-suite bathroom, connecting to a separate living room. Accommodates 2 adults and 2 children up to 17 years. Please indicate your flight choice in the notes on the booking form if applicable. 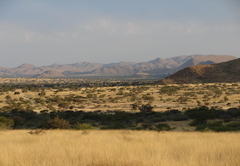 Set amid two rolling mountain ranges, Tarkuni is an oasis of serenity with beguiling views on every side. 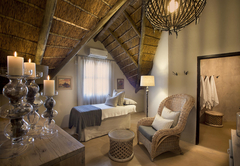 The private homestead accommodates up to 10 guests in five luxurious en-suite bedrooms. We offer tiered rates for smaller groups traveling. This was probably the most fantastic experience of our entire South African trip. 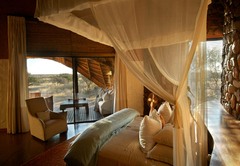 The service, the surroundings, the lodges, the game drives - everything was of the best standards and we loved every minute. HIGHLY recommended. 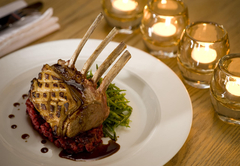 excellent meals, great game drives and wonderful lodges. HIGHLY Recommended. 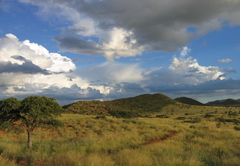 Response timeTswalu Kalahari Reserve typically responds to requests in 5-10 minutes.